Music is an ultimate offering and those who are connected to this refine artistry are truly aware of the magic it can create. And today's generation is blessed enough to reside in an age that is of course the finest of all in terms of streaming services available for the users. You see we have iTunes and YouTube music to spend the time the right way. However, we are not going to bring the benefits of the music on-board rather the write-up is all about transferring your favorite playlist from iTunes to Android. Transferring music from a device to another has become easier than ever with the portable offerings at our end including devices such as phones, laptops, and media players. These offerings are just exceptional when it comes to carrying around thousands of songs in only one small device. And when it comes to music streaming offerings software such as Apple’s iTunes bags the first position for allowing music lovers to sync their music with their various mobile devices. With iTunes, it gets convenient for the users to sync media files to a host of Apple devices. 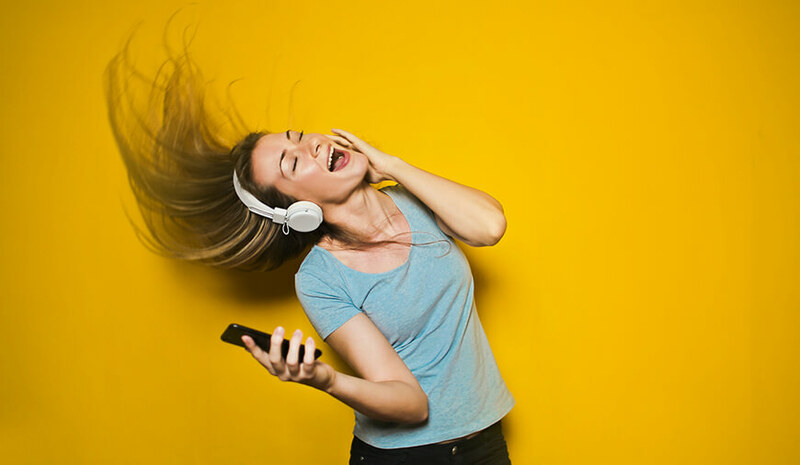 As the article focuses on helping users deport their songs from iTunes to Android, we will focus on the same by jotting down all the possible ways that are worth trying. The easiest way is to deport music by manually copying the iTunes music files into the PC (keeping it temporary into any folder). You could also deport the file directly from the iTunes library. Now you can use your USB cable to transfer the file from the computer. You could either copy-paste or drag-and-drop the files for transferring the same. The other equivalent method can be using a host of third-party apps to deport music from iTunes to Android. These third-party apps are truly impressive when it comes to transferring your music. It's an app-centric world today and we have a number of applications to get the music on our phone. The presence of cloud makes it even more convenient for us to get the lyrics of next best chartbusters. This cloud harness the power of storing as much data (music files and videos) as you wish to store on your phone. It also gives you the power to sync all your music on your device. Let’s get closer to the specifications associated with using Google Play Music. The first and the foremost requirement is to get the internet connection for the initial set-up (invest in creating an unlimited one). Google Play Music is a cloud-oriented service and thus you will be using your data most of the time. One way out to keep the track of your music data is to pin your favorites. Pinning is a great alternative to saving your data as it will mean you can download and save the music files to the phone’s storage. You will be amazed to know the fact that there is 50,000 song limit for every account users create on the cloud. It’s a great offering for those who have huge data to keep into their mobile phones. If you love to get the services, simply use Google Play Music. This will prove to be a great tool for you to store all your needs. 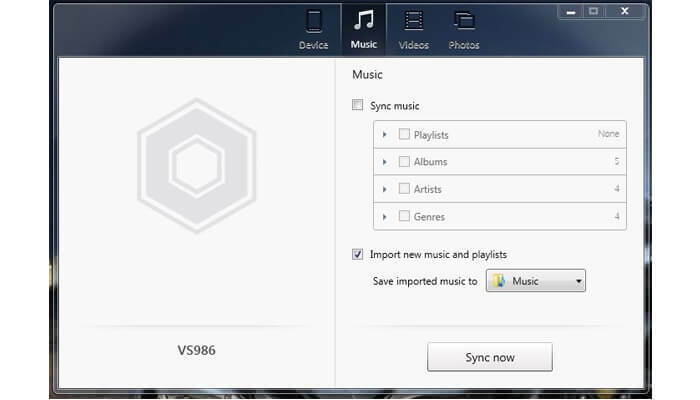 The tool will not only helps you to store the music but also permits you to sync your music folders with Google. In addition, it will help to queue all your songs to the cloud. Storing your music on the cloud allows you to enjoy great music on your compatible device. It is now time for you to set iTunes’ default file folders and then upload the files. As I told earlier there are a number of third-party applications to sync your music, the one that many users rely upon is doubleTwist app. Well, there are a number of third-party software to allow you to directly deport your iTunes music to Android, we have chosen this app for the functionality it offers to the users. doubleTwist is also our favorite as the app is available for both Windows and Mac. The app is exceptional to transfer the music files as it effortlessly helps to get your playlist on your favorite device. Be it music, video or any other such file, doubleTwist is your companion to get your iTunes music files on your Android phone. Here are the steps you can follow to do the settings. Connect your device (phone) to the computer. Do check if the Mass Storage mode (or MTP) is enabled on your phone or tablet. Your device should be recognized automatically, that will be indicated with a trigger syncing window. From here, you can use doubleTwist to deport all music files, playlists, or selected music files from iTunes to your Android phone. Click the Music tab in doubleTwist, select Sync music by check marking all the files you want to send to your phone (your list can include everything like playlists, albums, artists and genres). Click the Sync now button placed at the lower-right corner and this will deport your music to your Android phone. Download doubleTwist on your Android phone. Reach to the Settings tab and activate AirSync. Your app will display 5-digit passcode. Remember the passcode. The device name will appear under the Devices. Click on the device name in order to get into passcode entry screen. After the pairing is successful you can start transferring the iTunes files to the Android phone. 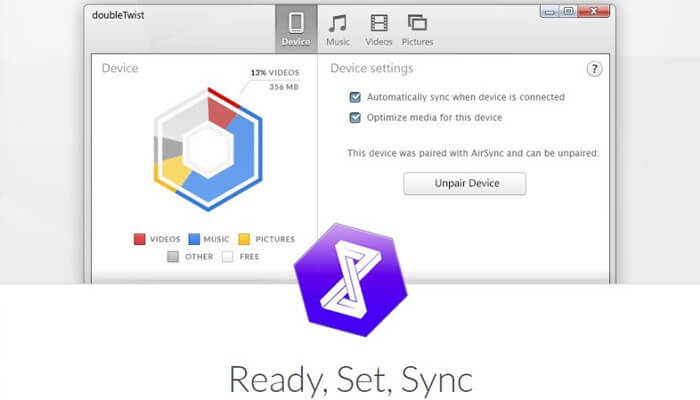 For less expensive wireless syncing, you could take advantage from Sync iTunes to Android app. With the free version, the users have the benefit to sync one playlist (that can have a maximum of 100 songs), the paid version Sync iTunes to Android - Pro comes for a price of US $2.99 that helps remove limitations and ads. Here are the steps to keep into the mind. Download and install Sync iTunes to Android on your Android device. 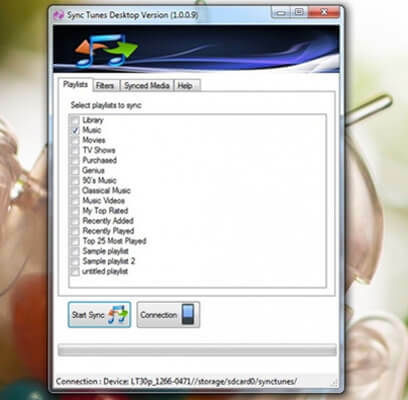 Also, install the Synctunes desktop client for your Windows PC. After launching the app, you will be notified with the IP address displayed at the bottom of the screen. Set Sync iTunes to Android on your computer and enter the IP address you noted down. Click on the category to deport from the list and tap on Start Sync. (premium version users can select multiple categories, music files,or the playlists.). Your device will have a window that will show all the media or the music files to be synced on your phone. Click Yes to continue. A pop up will appear to notify you about the successful music transfer. That’s all on transferring the music! !